Pets like to be entertained and comforted just like people do. That's why we offer a wide selection of quality toys at our shop in Anderson Township for your pet to relax and play with on every occasion, from the dog park to the home. 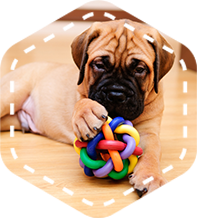 We carry fun toys like puzzles and snuggly toys too. We're proud of our country and where possible we sell products Made in the USA. Have your own idea for a toy? Let us know and we'll try to put you in touch with the right people.